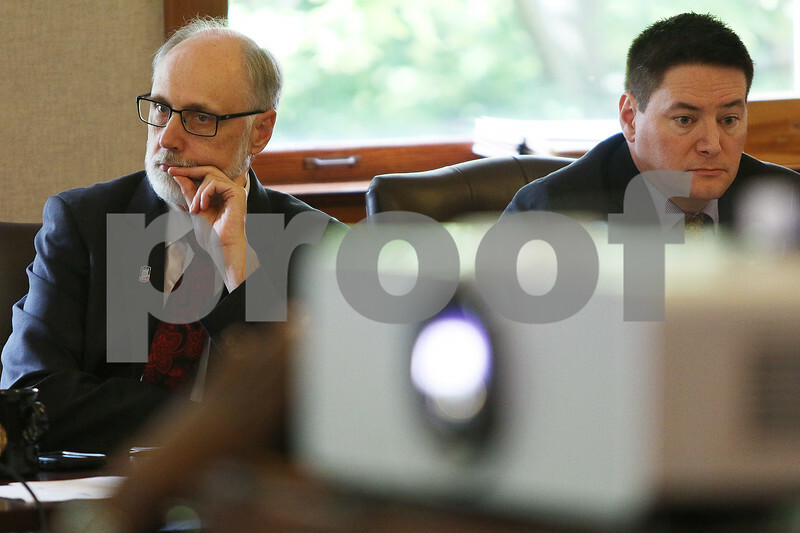 NIU President Douglas Baker, left, and Board of Trustees chairman John Butler listen to financial items on the agenda during a Board of Trustees meeting on Thursday, June 15, 2017 in the Board of Trustees room at Northern Illinois University in DeKalb. Baker announced his plans to step down as President effective June 30 to alleviate NIU from what Baker called a distraction caused by a report released from the Office of Executive Inspector General which found that Baker severely mismanaged funds. Baker hired friend and state of Washington resident Ron Walters as a part-time employee with a salary of $425,041, making Walters the third highest paid employee of the college behind Baker and football coach Rod Carey.